Arthroscopy is a surgical procedure used by orthopaedic surgeons to diagnose and treat problems inside a joint. The wrist is a complex joint with eight small bones and many connecting ligaments. Arthroscopy enables the surgeon to see the anatomic parts and their movements without making large incisions into the muscle and tissue. An arthroscope is used for two reasons: to make more accurate diagnoses (diagnostic arthroscopy) and to correct any problems with the joint. Arthroscopic surgery is a valuable diagnostic and treatment tool. Because it needs fewer and smaller incisions (ie, it is minimally invasive), patients generally have fewer problems and a more rapid recovery than with regular surgery. Because it is an outpatient procedure, you can return home several hours after surgery. Symptoms may occur at any time. Because many people sleep with their wrists curled, symptoms at night are common and may awaken you from sleep. During the day, symptoms frequently occur when holding something, like a phone, or when reading or driving. Moving or shaking the hands often helps decrease symptoms. You should come in for evaluation is you have these symptoms. They can be caused by a impingement of a nerve in the carpal tunnel, your arm, and/or your neck. Specific tests will help us define the problem. Symptoms initially come and go, but over time they may become constant. A feeling of clumsiness or weakness can make delicate motions, like buttoning your shirt, difficult. If the condition is very severe, muscles at the base of the thumb may become visibly wasted. The carpal tunnel is a narrow, tunnel in the wrist. The bottom and sides of this tunnel are formed by wrist bones. The top of the tunnel is covered by a strong band of connective tissue called the transverse carpal ligament. This ligament is release in carpal tunnel surgery. The median nerve travels from the forearm into the hand through this tunnel in the wrist. The median nerve controls feeling in the palm side of the thumb, index finger, and long fingers. The nerve also controls the muscles around the base of the thumb. 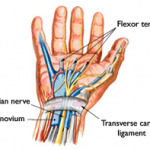 The flexor tendons that bend the fingers and thumb also travel through the carpal tunnel. Heredity is the most important – carpal tunnels are smaller in some people, and this trait can run in families. Age — it occurs more frequently as you age. Diabetes, rheumatoid arthritis, and thyroid activity can play a role. Usually, there is no single cause. Electrophysiological tests: Electrical testing of median nerve function is often done to help confirm the diagnosis and clarify the best treatment option in your case. Xrays and MRI of your wrist and neck may be necessary to ensure we are treating the correct problem! For most people, carpal tunnel syndrome will progressively worsen without some form of treatment. It may, however, be modified in the early stages. For example, if symptoms are clearly related to an activity or occupation, the condition may not progress if the occupation or activity is modified. Surgery may be necessary if you do not gain relief from nonsurgical treatments. In more severe cases, surgery is considered sooner because other nonsurgical treatment options are unlikely to help. In long-standing cases with constant numbness and wasting of your thumb muscles, surgery may be recommended to prevent irreversible nerve damage. Surgical technique. I perform minimally invasive carpal tunnel surgery on an outpatient basis under local anesthesia with sedation. This is so you don’t move as I operate next to your nerve.During surgery, a small cut is made in your palm. 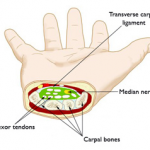 The roof (transverse carpal ligament) of the carpal tunnel is divided. This increases the size of the tunnel and decreases pressure on the nerve. A few absorbable sutures are placed under the skin and Dermabond (glue) is used to close your skin. You typically do not have any sutures on your skin. Once the skin is closed, the ligament begins to heal and grow across the division. The new growth heals the ligament, and allows more space for the nerve and flexor tendons. What is the surgical recovery like? Right after surgery, you will be instructed to frequently elevate your hand above your heart and move your fingers. This reduces swelling and prevents stiffness. Some pain, swelling, and stiffness can be expected after surgery. You may be required to wear a wrist brace for up to 10 days to 2 weeks. You may use your hand normally, taking care to avoid significant discomfort. Minor soreness in the palm is common for several months after surgery. Weakness of pinch and grip may persist for up to 6-9 months as the nerve recovers. Driving, self-care activities, and light lifting and gripping may be permitted soon after surgery. You can typically return to work in a few days to a week and with minimal restrictions on your work activities. Most patients’ symptoms improve after surgery, but recovery may be gradual. On average, grip and pinch strength return by about 2 months after surgery. Complete recovery may take up to a year. If significant pain and weakness continue for more than 2 months, you may need to work with a hand therapist. In long-standing carpal tunnel syndrome, with severe loss of feeling and/or muscle wasting around the base of your thumb, recovery is slower and might not be complete. Carpal tunnel syndrome can occasionally recur and may require additional surgery. Trigger fingers are more common in women than men. They occur most frequently in people who are between the ages of 40 and 60 years of age. Trigger fingers are more common in people with diabetes and rheumatoid arthritis. There are both injections and surgical treatments for trigger finger. De Quervain’s tendinitis occurs when the tendons around the base of the thumb are irritated or constricted. The word “tendinitis” refers to a swelling of the tendons. Thickening of the tendons can cause pain and tenderness along the thumb side of the wrist. This is particularly noticeable when forming a fist, grasping or gripping things, or when turning the wrist. De Quervain’s tendinitis is caused when tendons on the thumb side of the wrist are swollen or irritated. The irritation causes the lining (synovium) around the tendon to swell, which changes the shape of the compartment. This makes it difficult for the tendons to move as they should. Tendinitis may be caused by overuse. It can be seen in association with pregnancy. It may be found in inflammatory arthritis, such as rheumatoid disease. De Quervain’s tendinitis is usually most common in middle-aged women. There are both nonsurgical and surgical treatments for wrist tendonitis. Distal radius fractures are very common and often happen after a fall onto outstretched hands. It can also happen in a car accident, a bike accident, a skiing accident, and similar situations. Osteoporosis (decreased density of the bones) can make a relatively minor fall result in a broken wrist. Many distal radius fractures in people older than 60 years of age are caused by a fall from a standing position. A broken wrist can happen in healthy bones, if the force of the trauma is severe enough. A car accident or a fall off your bike may generate enough force to break a wrist. Immediate Treatment:If the injury is not very painful and the wrist is not deformed, it may be possible to wait until the next day and make an appointment for treatment. The wrist should be protected with a splint or other immobilization. Icing on and off every 30 minutes with a cloth over your skin can relieve pain. Continuously elevate your wrist above your elbow, shoulder and heart. Elevation and ice help swelling to go down, decreasing your pain.If the injury is very painful, if the wrist is deformed or numb, or the fingers are not pink you may need to go to the emergency room.My treatment is individual to each person not just the type of fracture and depends on many factors, such as the nature of the fracture, age, profession and activity level. Cast Treatment:If the broken bone is in a good anatomic position, a cast may be enough to heal the bone with no other intervention.If the position (alignment) of your bone is not anatomic it may limit the future use of the arm. I typically numb the wrist with a local anesthetic and replace the bones in a better position. This may be enough to avoid surgery. I then place a cast for several (4-6) weeks until a removable wrist splint can be applied.Flouroscopic imaging or xrays may be needed weekly at first to ensure the bones do not slip back to an unacceptable position. Once the bones heal physical therapy can help improve the motion and function of the injured wrist. Surgical treatment:Not infrequently, the wrist is so out of place that it cannot be reliably corrected in a cast. This has the potential of interfering with the future functioning of your arm. In this case, surgery may be required. You may prefer surgery to a cast since you will not be immobilized in a cast after surgery. If you rely on your hands for work, surgery may speed your return to work.Depending on the fracture, there are a number of options for holding the bone in the correct position, metal pins, a plate and screws or a combination of these techniques. Most fractures and surgeries hurt moderately for a few days to a couple of weeks. You will find that using ice, elevation and non-prescription medications for pain relief are all that are needed. Ibuprofen and Tylenol: The combination of both is much more effective than either one alone. In the first few days you may need to take a prescription strength medication such as Vicodin. Casts and splints must be kept dry. A sealed plastic bag over the arm while showering should help. Surgical incisions must be kept clean and dry until the sutures (stitches) are removed. What can I expect after my wrist has healed? Most patients will start physical therapy, if their doctor feels it is needed, within a few days to weeks after surgery, or right after the last cast is taken off. Most patients will be able to resume light activities, such as swimming or exercising the lower body in the gym, within a month or two. Most patients can resume vigorous physical activities, such as skiing or football, around three to four months after the injury. Almost all patients will have some stiffness in the wrist, improves with time, therapy and active use. Surgery will lessen this time compared to treatment in a cast. Improvement will continue for at least two years. Recovery should be expected to take at least six months. Some pain with vigorous activities may be expected for about that long. Some residual stiffness or ache is to be expected for high-energy injuries (such as motorcycle crashes, etc), in patients older than 50 years of age, or in patients who have some osteoarthritis. However, the stiffness is usually minor and may not affect the overall function of the arm. Remember, these are general guidelines and may not apply to you and your fracture. We know that returning to activities is important to you and each injury is individually treated on a case by case basis. The scaphoid is one of the small bones in the wrist on the same side as your thumb. It is frequently injured in falls. A scaphoid fracture is usually caused by a fall on an outstretched hand, with the weight landing on the palm. The distal radius may also break in this type of fall, depending on the position of the hand on landing. 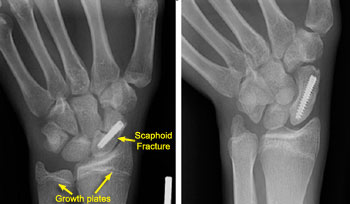 Fractures of the scaphoid occur in people of all ages, including children. The injury often happens during sports. There are no specific risks or diseases that increase the chance of having a scaphoid fracture. Weaing wrist guards during activities like rollerblading and snowboarding can decrease the chance of breaking your wrist. Scaphoid fractures usually cause pain and swelling at the base of the thumb. The pain may be severe when you move your thumb or wrist, or when you try to grip something. In some cases, the pain is not severe, and may be mistaken for a sprain. It is important to get an xray, or MRI of your wrist as these fractures are commonly missed, even in emergency rooms. A simple “sprained” wrist is rare and it is important to see an orthopedic specialist if your pain persists. An MRI can visualize the bones and soft tissues for other injuries. This sometimes shows a fracture of the scaphoid before it can be seen on an x-ray. Scaphoid fractures can be very difficult because of poor blood supply to this bone. Treatment depends on the location of the break in the bone, and your need to get back to your activities and work. This bone heals much more slowly than most bones in your body. If the scaphoid is broken in the middle of the bone (at the waist) or closer to the forearm (proximal pole), healing is more doubtful and I typically recommend surgery with a two wires or a single screw. These areas of the scaphoid do not have a very good blood supply. Sometimes, the screw or wires can be placed in bone fragments with a small incision. In other cases, a larger incision is needed to ensure that the fragments of the scaphoid line up anatomically. In cases where the bone is in more than two pieces, a bone graft from your hip or wrist may be needed to aid in healing. A bone graft is new bone that is placed around the broken bone and is used to stimulate bone healing. It increases bone production and helps broken bones heal together into a solid bone. Some people have wrist stiffness after scaphoid fractures. This is more common when a cast was needed for a long time or when the fracture requires more extensive surgery. It is very important to maintain full finger motion throughout the recovery period. An exercise program and hand therapy will help you regain motion and strength in your wrist. Nonunions: A bone that fails to heal is called a nonunion. Nonunions are more common after scaphoid fractures because blood supply to the scaphoid bone is poor. Blood supply to the bone is very important in its healing. Bones need blood to carry oxygen and nutrients to the site of the fracture. This can occur with treatment in a cast or less commonly even after surgery. 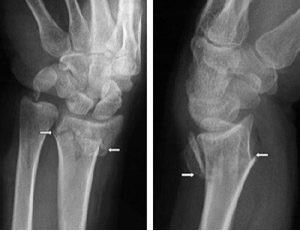 Avascular Necrosis: When the scaphoid is broken, especially when the fragments have moved apart (displaced), the blood supply to those fragments may be disrupted. Sometimes, the blood supply to one of the fragments is so poor that the piece does not get enough nutrients and the cells in that fragment die. This is called avascular necrosis. Surgery is generally needed in this case. Arthritis: Over time, nonunion and avascular necrosis of the scaphoid can lead to arthritis of the wrist. This usually is from a missed or neglected fracture. If x-rays show arthritis in the wrist as a result of an old break in the scaphoid, treatment focuses on improving the symptoms of arthritis. If this does not work, there are a variety or surgical solutions that can help you with pain relief and function. A newer technique uses a small incision —about 1/4- to 1/2-inch long. The smaller incision may decrease the chances of long-term stiffness in the wrist by decreasing the time that a full-time cast needs to be worn. This procedure is done using a special Flouroscopy (x-ray) machine during surgery to help guide the placement of the screw. Not all fractures can be treated this way. I only use this method for select fractures because anatomic alignment is the most important factor in your recovery. In addition, wrist arthroscopy (a tiny camera) to look directly at the fracture may help with the fixation of the bone and speed healing. Your thumb is your most important digit. A stable thumb allows for pinch and grasp activities. A thumb sprain is an injury to the main ligament in the thumb. Ligaments connect two bones to make a stable joint. If you tear the main ligament (ulnar collateral ligament) at the base of your thumb, your pinch and grasp ability will be weak. When you fall, it is natural to extend your arms to reduce the impact from hitting the ground. If your thumb is caught in the strap of your ski pole, or on your handlebars as you fall forward, the ligament can be torn. In this sprain, the ulnar collateral ligament is completely torn and may require surgery to heal. A sprained thumb weakens your ability to grasp items between your thumb and index finger. Other symptoms include bruising, tenderness, and swelling. The ulnar collateral ligament of the thumb may be partially or completely torn. To help determine this, I will move your thumb in different positions to test how stable your thumb joint is. X-rays are needed to ensure that the bone is not broken. A special type of x-ray, called a stress x-ray, shows the joint as I apply tension to the injured ligament. If the test causes pain, a shot of a local anesthetic may help. An MRI is sometimes necessary in cases where the diagnosis is difficult or your thumb is too tender to examine. What is the nonsurgical treatment? If the ligament is only partially torn I will immobilize your thumb joint with a cast, or splint until it heals. To ease pain and swelling, you can place an ice pack on your thumb twice a day for 2 to 3 days after the injury. For the first 3 weeks after your injury, you wear the splint or cast at all times. After that, you can take it off to do strengthening exercises for your thumb. The splint should be worn at all other times. This should continue for another 2 or 3 weeks, until the swelling and tenderness in the thumb are gone. If the ulnar collateral ligament of the thumb is completely torn, surgery may be needed to regain normal movement. Surgery involves reconnecting the ligament to the bone. When the ligament tears away from the bone, sometimes fragments of bone are pulled away with it. If this is the case, then during surgery, the bone fragments may be removed or put back into the correct position and fixed with a pin or screw. After surgery, a short arm cast or a splint will be necessary for 4 to 6 weeks to protect the thumb ligament while it heals. A sprained thumb is often ignored with the hope that it will heal itself. If this ligament injury is not diagnosed and treated properly, it may lead to chronic instability, weakness, and ultimately arthritis. If a thumb sprain leads to these late complications, it may require surgery to rebuild the ligament using tissue from another part of your upper arm. Another treatment option might be a joint fusion. We want to avoid this by correctly diagnosing your injury and treating it properly from the start.